Nationally, women in Canada make an average of 32 percent less than men. According to Statistics Canada, the gender wage gap is even wider for women belonging to minority groups. For example, women with disabilities face a 46% gender pay gap; Indigenous women face a 35% gap; and racialized women a 33% gap. UFCW Canada sees closing the gender wage gap as a national priority and consistently pushes all levels of government to address this urgent issue. Accordingly, we stand in solidarity with organizations like the Ontario Equal Pay Coalition to advocate for a future where women workers are paid what they are owed. A key part of achieving a fairer future will involve enacting pay transparency laws. Pay transparency laws are new "access-to-information" tools that are being used to fight pay discrimination. They require employers to disclose their pay practices so that workers know if they are receiving fair pay or not. Thanks in part to the advocacy efforts of UFCW Canada, Ontario recently enacted a pay transparency law that requires employers with 100+ employees to report the gender pay gaps in their workplaces. But the Ontario government has stalled the Act's implementation indefinitely. In many other parts of Canada, pay transparency laws have yet to be introduced. Evidently, the fight for equal pay and pay transparency laws continues. But you can help close the gender wage gap by supporting UFCW Canada’s Closing the Gap campaign. 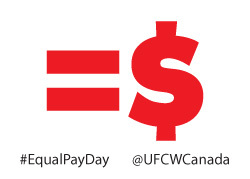 You can also print our Equal Pay Day 2019 poster and post it in your workplace, or post pictures on social media showing your support for closing the gender wage gap using the hashtags #EqualPayDay, #ClosingTheGap, and #EconomicJusticeNow (be sure to tag @UFCWCanada when posting your pics!). And you can share UFCW’s Equal Pay Day infographics throughout the month of April.